I know that many people say this all the time and I am just repeating what has been said many times before, but seriously, blogging can be really hard sometimes. It's difficult to do it well when you have other commitments in your life, and those commitments just keep getting bigger and take up more and more time. So then you have less time to read and even less time to blog, and you sometimes feel annoyed that you are trying to catch up on blogging instead of doing so many other brilliant activities that you can't think of at the moment but are sure that you could do if you just had the time to spend doing them. So then you blog, but maybe you don't put your heart into it, and you aren't sure if you are even doing it that well. And I have enough of a Type A personality to not really want to do something if I can't do it well. So how does that relate to A More Diverse Universe? Well, I really want the event to happen again, and I want it to be great, but I also just do not have the time (though I hope I do have the heart) to put that much into it, and so I am not convinced that I am doing it well. And in that case, is it worth me doing it? Just to throw it out there, I am going to be really, really disappointed with myself if A More Diverse Universe tour is not at least as big (fine, let's be honest - bigger) than last year even though I said in last week's post that this year it's being done on the fly because there just isn't the bandwidth to do more. And even though I know I just can't talk it up or hype it up or do as much for it as before. I still want it to be huge and amazing and a small but important impetus for social change. I just want it to do that with minimal help from me. OR, I want to have enough time to work on A More Diverse Universe and make it a grand success without giving up all the other things that I could be doing with my time instead. I realize this is completely illogical. It makes no sense and puts a lot of pressure on me for no reason. But when you spend a lot of time doing something - and that something takes time away from you doing other things - then you want to see some sort of pay-off. And obviously there isn't a monetary pay-off, so I need SOMETHING. Blogging is, in essence, our attempt to win friends and influence people. You hope that what you say will somehow convince someone else to pick reading a book you recommend over doing something - over doing anything - else with that amount of time that they have available. 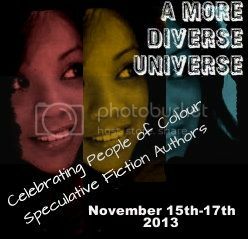 And big blogging events like A More Diverse Universe are asking for even more. Now, you are no longer saying "read this book" but "read this type of book right now" and, if the event is truly a success, "read this type of book consistently for the rest of your life." How do you convince someone you've never met to make a commitment to a cause that matters to you but not necessarily to her? And what happens to your self-esteem when you judge your own success on your ability to do just that? It's easy to generally believe that your blog is important and people read it and think about what you say and will maybe read the books you recommend. But it all becomes much more real when you host an event like A More Diverse Universe and hope desperately that people sign up and participate to prove to yourself that you count. That when you speak, people listen. It's like hosting a party and 30 minutes after the start time, no one has arrived, and you start to feel that panicky feeling in your gut that while people enjoy your company, no one wants to be the first one to arrive, and you didn't realize it until just now. I realize this post probably sounds quite needy and perhaps you think I am trying to guilt you into signing up for A More Diverse Universe. I'm not. (Um, but I think you should. Obviously. See entire post above.) It just got me to thinking about how vulnerable we can be here in the digital world. When do all of you feel most vulnerable while blogging and how do you deal with it? And how do you feel about the idea of "doing something well or not doing it at all?" I am planning to participate in A More Diverse Universe but haven't done anything about it yet. I want to find another Australian Aboriginal author like I did last year but I am not sure if that will be possible or not. I know the author I read last year has a new book coming out so it depends on whether I can get that in time or not. In answer to your questions, I feel that sense of panic about no one showing up to the party every time that I do the events. As an example, there is always a bit of doubt whenever Kelly and I start doing the Virtual Advent stuff every year! I remember how much trouble you had finding an aboriginal author last year, Marg. It's strange that there are so many in general but not in the sci fi/fantasy space. I wonder why that it? And yes, Virtual Advent is another one that I think requires a lot of faith and hope that people will show up to the party. Marg, I don't know what Aboriginal Australian author you read last year, but I just read and loved The Swan Book, which is by Alexis Wright, an Australian Aboriginal. Its one of my best books of this year. mdbrady, last year I read The Interrogation of Ashala Wolf by Ambelin Kwaymullina. The only other book that was suggested was Alexis Wright's previous book Carpentaria which I had DNF'd a few years ago. Someone else I know recently read The Swan Book so it might be an option. I can relate to lots of what you said. Yep, blogging makes you vulnerable - putting yourself out there always does, and that becomes more obvious than ever when you ask people to take their scarce free time and commit to something you believe really matters right alongside you. I have no solution, but I hope that you knowing you're not alone will help at least a tiny little bit. Also, we can help by doing our share to raise awareness - we all have limited time, but if we pool our limited time together we can signal boost this and increase our reach. At the end of the day you're still hosting the party, but not only will your friends happily be the first to arrive, they'll also help you make sure everything goes smoothly . Sometimes we have to be brave enough to try and fail. It's not the end of the world. I think it's too easy to take blogging personally. Some post and challenges do very well. Some get no response at all. It's not personal and it really may just be a random result in a random blog-o-verse. That's not really what I mean, though. It isn't as though if I stopped blogging and came back, that I'd view it as a hobby more than a job and enjoy it so much more. It's that I think it is much MORE than just blogging about what I've read, it's a way to push for change, and to do that well, I feel like I need to view it as a job. Sorry if that didn't come out clearly in the mumbo-jumbo above. I remind myself that there's benefit to this sort of activity even if no one shows up. Your event brings attention to these authors and that's the important part. My awareness is raised even if I don't manage to read a book and participate. Sometimes it takes repetition for something to take off -- in the case of the annual events we run on our blogs, that means it's going to be years. So, I'm working on cultivating patience. That's true! If not instigating action, at least you are generating awareness, which is hopefully something that people will take with them as they continue their reading journeys. Thanks, Joy! I agree, blogging CAN be hard. I go through major waves - the latest being that it took me like a month and a half to write my first post-vacation post. I thought that once I started I'd have to keep it up (which is true) so I found other things to do. As for your question - yes, it's still worth doing A More Diverse Universe. You bring attention to authors who don't get that much, it's great. If I'll sign up, if I can manage to remember to, too many things in my head right now and I'm having trouble keeping scheduling promises! I really relate to this post. I have a really busy job (I'm a teacher) and sometimes it can be a few days before I get to post something or visit other blogs. Whenever this happens, the number of visitors and people who comment on my posts drops significantly and it always makes me feel insecure! Yes, people really only come to you if you go to them, right? But at the same time, I really only blog visit on weekends, so maybe that's just when the majority of commenting happens. I really feel this, and I also think the event is going to be great. I'm going to participate and I did not sign up with Mr. Linky because I got nervous that I'd jinx myself by signing up, and not end up doing it (I often rebel against my own reading plans). But I will go sign up right now. It's my time to love Octavia Butler even though I didn't care for Kindred. Which Butler will you be reading? Wild Seed? I know, so annoying! I don't know why it doesn't work on Chrome. I'm a last-minute person when it comes to blogging, much as I'd love to have a blog schedule planned out a month in advance! I created a blog calendar during Bloggiesta and only got the first planned post done, and that was only because I was just posting something someone else had sent me. It has been a REALLY busy couple of months at work and with other activities, and my blog has definitely suffered. If I saw your DU post, I probably thought, oh, November, I have plenty of time, but I think I missed it altogether! This may be my year to finally read Octavia Butler! I completely understand, though I also think Octavia Butler is well worth making time for! I wrote about the urge to talk about books I think are important in my post about Why I Blog, and concluded that it's not always up to me to decide which books are important. I also internalized Florinda's comment about "companionable silence." Even if other bloggers who have participated in the past are too busy to commit to a blog event year after year, you can feel pretty sure that they're cheering the event on, and hoping newer bloggers with more time will step in to take up the cause. Funny, I guess I just made the argument that us "older" bloggers should spend some time conversing with newer bloggers.That's not something I wanted to need to make time for. Oh, I like the idea of "companionable silence." That's a really nice way to think about blogosphere. I've been looking for some books to read for A More Diverse Universe and have found it harder than I expected to find something that both appeals to me and will qualify, so I think that proves how important and necessary a tour like this is. Whether 10 bloggers participate or 100, it will still be worthwhile if it helps to raise awareness and highlight authors people might not have considered trying otherwise. I'll sign up with the Mr. Linky now! Helen, there are a lot of reading lists linked to in the introduction post if you want to look there for some inspiration! Could you are somebody post a list of the books people read last year for DU? If you go to the link at the beginning of this post, where the sign-up link is, there are a lot of places you can go to see book recommendations, including last year's list. I'm just catching up on reading posts but I'd love to join in too. I really don't know why it's taking me longer this year to catch up with blogging and reading but it's probably due to the exponential increase in blogs out there too. Now I just have to choose what to read! I read this the other day, and I just wanted to say that I feel you about the combined burden and passion for the blog. I'm in a different situation, but I've had to repeatedly remind myself that I'm choosing between building the blog as its own entity and investing in it, or keeping it for me, as a journal and a fun outlet. I can't do both, and right now I need to keep my investment of time and energy at a personal level. Otherwise it's too much for me. But it's a frequent source of tension for me, so I have a LOT of sympathy. I'm leaving this comment mostly to encourage you to continue with this project and partially as an apology. The encouragement is because I think it's a worthy goal and I think that placing the spotlight on diversity can only ever enhance our understanding of literature and the world (beyond the day-to-day focus, that is). The apology is because as much as I would like to participate, I just... can't. I can't be certain what's happening in a month, and certainly not what books I'll have access to (side effect to living in a non-English speaking country). But like last year, I'll be following along remotely and reading the posts with great interest. I just spread the word over at my own place, which might ripple down into the Kidlitosphere a bit...I hope, maybe. But in any event, thanks! It is hard. And I hate thinking of the abandoned projects I have - The Poetry Project, for one. EVERYTHING you said in the fourth paragraph really reminded me of how I felt doing The Poetry Project. I just wanted everyone to care so much about poetry and we did get quite a few people to participate, but in the end, I dropped the ball and couldn't justify beating myself up over it. I still regret not finishing out the year and I also *really* want to bring poetry back into my blog somehow. I want to be better about all of it, but I also don't want to stress out about blogging. It's such a hard thing to balance, but I'm hoping that, 5 years later, maybe I'll figure it out? I think that a lot of us can relate to this post! As for A More Diverse Universe - I have been out of the loop, so I didn't know it was going on again this year, but I will DEFINITELY be participating. I just signed up :). I will talk about it too, but I don't think my blog is going to be much of an influence! So, I'm late to this but I thought I'd write anyway to encourage what a GREAT thing you're doing. Don't forget that by putting A More Diverse Universe on the internet there really doesn't have to be a 'this year' and a 'last year'. Time is sort of irrelevant. Appropriate, right?! Last year's AMDU is still alive and kickin' with folks recommending the books they read to other folks and maybe some of those books being donated to libraries or second hand stores to be read by new readers. I see it as you building a really beautiful, sound shelter in a large empty field. If you build it well, then it will stand for a long time and maybe other people will build around it and years from now it's a thriving city. Or maybe only one person ever passes the building but he or she finds comfort in it, remembers it, and later starts a city someplace else. So just keep doing great work. The universe will help you, just like you're helping Octavia Butler, and Intisar Khanani years after they wrote their work. Thank you, Ellie! You don't have to blog, just read :-) But you can write a guest post either here on my blog or on someone else's, if you would like!